Greetings PEC friends Post General Assembly!! 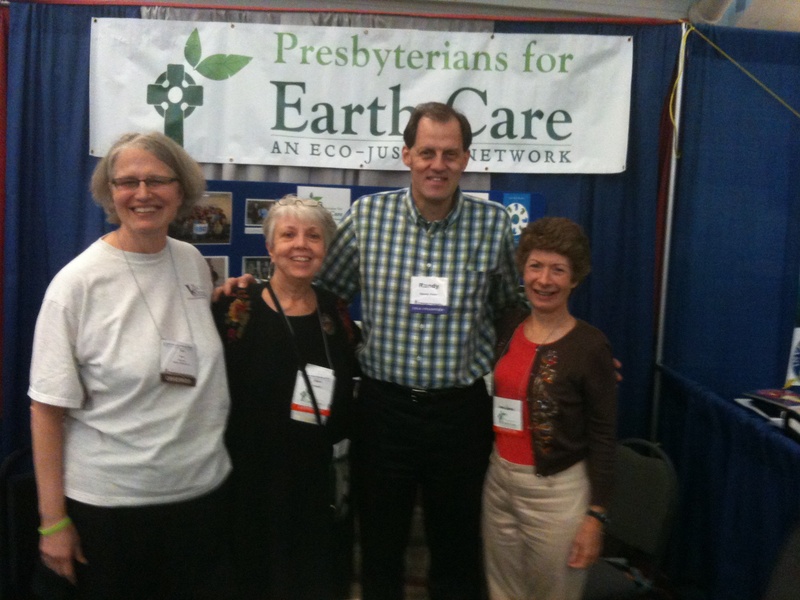 Presbyterians for Earth Care had a visible presence at GA and the experience was excellent. We were represented at the booth and luncheon by our Executive Committee and we were thrilled to make contacts with dozens of Presbyterians who have a deep concern for doing Creation care. During the PEC luncheon, we highlighted our partnership with Environmental Ministries, the Presbyterian Hunger Program, and the Office of Public Witness, among others. We were blessed to meet in a beautiful space in the chapel of First Presbyterian Church, Pittsburgh, among fresh flowers and Tiffany windows. We were grateful for the Rev. Dr. Randy Bush bringing us a charge for creation care..."to exist is to co-exist." We also congratulate the winners of our annual awards, who were present to receive them. Tom Quigley, director of The Garden of Etna, a community garden, has done much in Pittsburgh to further environmental justice. He accepted the William Gibson Achievement Award. Earth Covenant Ministry in Atlanta, a partnership of 10 congregations in Atlanta working toward intentional stewardship, accepted the Restoring Creation Award. In addtion to our award winners, we are grateful to have had many other excellent nominees. You can read about their good work on our blog: Alaska Interfaith Power and Light, Glenshaw Presbyterian Church, Earth Care House Church of Trinity Presbyterian Church, and Lynn Cameron. A special thanks to Rob Remsburg, previous PEC treasurer, who helped with our booth while serving as commissioner, Lauren Wright, an Eco-Steward and Young Adult Volunteer, as well as many others who helped with the booth and came by to visit!!! We greatly appreciate you all!! Blessings and strength to all of us as we travel in our many ways post-General Assembly...in furthering our work in tending this beautiful Garden. P.S. PEC is highlighting two conferences in July: A conference on environmental stewardship will be presented by the Presbyterian Men of the Mid-Atlantic on July 20, 21 and 22 at Massanetta Camp and Conference Center in Harrisburg, VA. Please click here for more information. We also highlight the 2012 Churchwide Gathering of Presbyterian Women, "River of Hope", being held in Orlando, FA July 18-22. Check the link here. PEC sends our very best to all involved in both conferences. Lynn is presently pastoral leader of Earth Care House Church, the environmental arm of the home church, Trinity Presbyterian Church. 1. Took an overture to the 2002 GA in Columbus, Ohio asking PCUSA to accept as the Church’s position its desire to see grandfathered coal-power plants we need to research this and get the actual wording. 2. Led ECHC to its Fall Retreat at Lambert Cabin, a facility owned by PATC. The Potomac Appalachian Trail Club has many members in our congregation. Lynn and her husband are “Caretakers” for a section of the trail and maintain it with non-gasoline powered tools. Church youth are led by Lynn to use old fashioned cross-cut saws to remove fallen trees from the trail. She shows them how to use spades to form trenches to deflect runoff water from the trail reducing harmful erosion. 3. Expended countless hours getting organizations of all stripes and flavors to become sponsors of Friends of Shenandoah Mountain. 4. Does not simply talk: she walks the walk. She and her husband bought a tract of forest land adjacent to the Shenandoah National Park because she had found in her research as a professional librarian that this tract contain a very unique “wet land” high up the mountain side. This wet land provides water for flora and fauna. 5. Love of God’s creatures manifested in their ownership of several llamas. Church youth from area congregations not all Presbyterian, have mingled with her llamas; she shows these young persons how to pretend that they, too, have breaths which llamas need to sample before establishing llama trust. It is amazing to see a second grade girl, hands behind her back, leaning forward while breathing, in an effort to establish trust on the part of the beast. 6. Long history in environmental work in the church. For example, she was a long time friend with Ernie Dickerman who is considered by many to be the father and founder of the Virginia Wilderness Society. With his help, our house church was able to bring Richard Cartwright Austin to Harrisonburg for a three-day workshop and seminar. 7. Worked tireless to bring Harrisonburg’s “Friendly City Food Coop” into existence. Although no official count has been taken it is a safe bet that every member of ECHC is a partner here. One of our church youth (a college student) is an employee of the Coop working her way through JMU. 8. One year ago in 2010, Lynn was the driving force behind Trinity Presbyterian Church’s earning its “Green Congregation” status. After the award arrived here, she and her husband continued finding additional items of interest. 9. 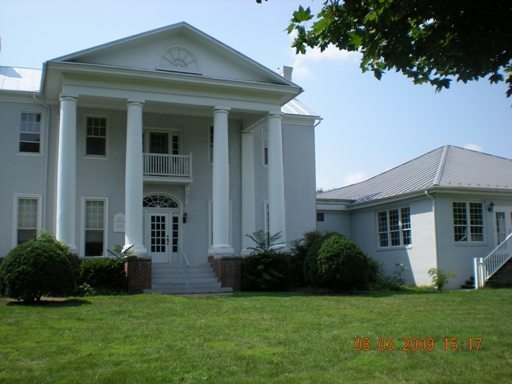 Earth Care House Church, the environmental house church at Trinity Presbyterian Church, Harrisonburg, VA, scheduled a retreat near Shenandoah National Park. Lynn and Malcolm Cameron are members of the Potomac Appalachian Trail Club. This club became owners of a most unique cabin near Luray. We were permitted to hold our autumn retreat 2010 in this cabin. The mountain setting, the crisp autumn weather, and the cabin’s legacy gave an extra spirituality to our worship and retreat. This retreat would not have been possible absent Lynn’s contacts in this outdoor hiking organization. Our pastor’s husband who recently died of cancer was a past president of PATC. Lynn has been working for ten years to obain wilderness status for 90,000 acres located in the George Washington National Forest. Friends of Shenandoah Mountain is a voluntary local coalition of businesses, individuals, faith groups, hunters, conservationists, hikers, mountain bikers, and others who have come together to protect these areas. "From the top of Reddish Knob one can behold the breathtaking beauty of Shenandoah Mountain. As stewards of god's good creation, we need to preserve this unique natural area for generations to come. "-Ann Held, Pastor, Trinity Presbyterian Church, Harrisonburg. Each year, Presbyterians for Earth Care receives nominations for two awards: The William Gibson Lifetime Achievement Award for individuals and the Restoring Creation Award for congregations, governing bodies, ecumenical agencies, or Presbyterian-related entities. In 2012, we received so many excellent nominations and could only choose two awardees. All the nominations bore such good news about what God's people are doing to care for God's Creation, we'd like to share them all with you. Interfaith Power & Light (IPL) is a national affiliate of The Regeneration Project, a non-profit organization working to deepen the connection between ecology and faith. To date, TRP's national IPL network comprises 31 state affiliates, transcending socio-economics, cultures and denominations. As an increasing number of scientists, indigenous peoples and other leaders declared Alaska as ground zero for climate change, it became clear an IPL affiliate must be established in the Great Land. In 2006, Alaska Interfaith Power & Light became the 20th IPL state affiliate. Currently, out of the 250 conservation non-governmental organizations in the state, Alaska IPL is the only organization calling attention to our moral obligation to serve as stewards of creation and subsequent symptoms of the human family not living-up to this responsibility to the best of our ability, including human-induced climate change. Although AKIPL has worked to engage faith communities in common sense practices like energy audits for buildings and changing light bulbs, Mary Walker's vision led to one particular project that needs to be especially recognized. Since May 2011, AKIPL has been holding a series of interdisciplinary public forums aimed both at raising public awareness regarding the moral imperative for dealing with human-caused climate change, and lobbying for governmental and and personal responses. 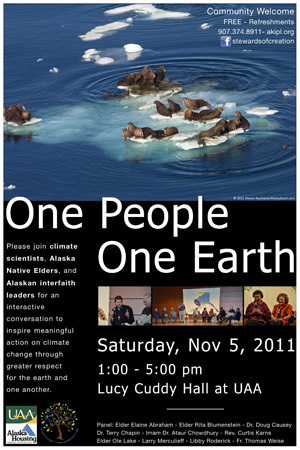 These public forums are held under the title of One People, One Earth (http://onepeopleoneearth.org/), Participants include scientists (an ecologist, a biologist, a physicist and an oceanographer) from the University of Alaska, Alaska Native Elders from three Native American peoples (Tlingit, Aleut and Yupik), and four Alaskan faith leaders from Roman Catholic, Protestant [PCUSA], Islamic and Jewish). Though these participants embody important differences, they also speak passionately about the importance of this issue and their absolute unity in dealing with this as a world people. One interesting outworking of this has been a particular interest in the comments from the faith leaders. Their latest pubic forum was held in Juneau, where a separate public meeting was held just to spend more time talking with the faith leaders. It is hoped this public, interdisciplinary approach will continue to build momentum and add to the public will for the change necessary to mitigate the damage caused by a carbon fueled industrial age. 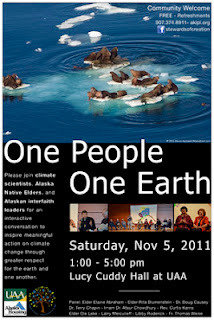 One People, One Earth continues to gain recognition. In the past two weeks, there has been conversation abut bringing this interdisciplinary panel to events outside of Alaska. it would be helpful for PEC to recognize this effort. web site www.glenshawchurch.org; Monthly emails on earth care are sent out to members and information is provided on a bulletin board, through Sunday bulletins and in the church newsletter; Energy efficient windows and air conditioning was installed; All office and church school wastepaper is recycled as well as metal cans, plastic, glass, electronic equipment and ink cartridges; A large bin is available in the parking lot for community use for paper recycling; Have begun to reduce toxic cleaning products; Offer vegetarian choices at dinners; Limit use of paper products at dinners; Children participate in church sponsored camping trips; Establishing and being an ongoing sponsor of the Etna Community Garden; Collaborate with other community groups concerning earth care; Have shared information concerning earth care with other groups. Glenshaw Presbyterian Church with the backing of their pastor, the Rev. Dr. Mike Hoyt, an advocate of environmental stewardship and their "Green Team" of volunteers have implemented numerous programs within the church and out in the community. They see their responsibility for the earth as an outgrowth of their relationship to God. Two major projects have been: transforming a former playground on the church grounds into a lush, beautiful prayer garden and helping to start the Etna Community Garden. Through the community garden fresh produce is donated to the local food pantry and it also gives residents of the community the opportunity to grow their own fresh produce. Educating and involving members in environmental stewardship, including the children and youth of the church, is a high priority. It is their hope that other churches in the area will also work to become Earth Care Congregations and GPC members are willing to mentor others to reach that goal. Each house church is approved and operates under the aegis of the Session. A covenant renewed each year stipulates that four marks of the church will be observed: mission, worship, nurture, and fellowship. The covenant also requires this particular hose church to engage in Care of Creation. To meet these requirements, Earth Care House Church has acted in several arenas. 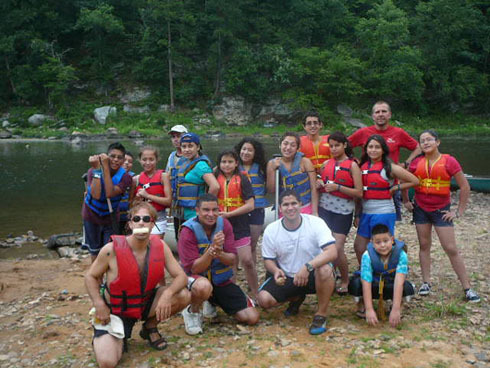 • A member of ECHC received a grant from Virginia Wilderness to take children on field trips to Hone Quarry for a period of several weeks. The third and fourth grade students from Keister Elementary were recently highlighted in local Daily New Record Article. ECHC paid for the water testing kit. • ECHC included youth on a recent hike to High Knob Tower. • ECHC (then known as Restoring Creation House Church) led the congregational youth on a hike and worship on the west sloop of the Blue Ridge Mountains near Grottoes, Virginia. Carried Hymnals to high sloop near Sky Line Drive in the Shenandoah National Park. This land, which is on the Wetlands Registry, is owned by members of our group. • ECHC donated to Massanetta Springs Camp and Conference Center several trees. These were planted under supervision by adult members. 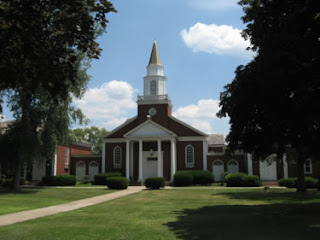 • Trinity Presbyterian Church was re-certified as a Green Congregation by PC(USA); originally certified on December 12, 2010 as one of two PC(USA) Churches in Virginia, with this status. • Members of ECHC are working to provide garden fresh vegetables by planting a raised bed on the church property. These vegetables will be distributed to the clients of Trinity’s Kara House Church. • Members of ECHC then RCHC traveled in a 15 passenger van to Charlotte, North Carolina to receive an award for our environmental efforts. • Members of ECHC attended the General Assembly in Columbus, Ohio with the express purpose to carry a resolution to remove grandfathered power plants from the nation’s power plants. Lobbied and were successful in getting approval of this landmark legislation. This congressional act would require that scrubbers be placed on these coal fired power plants. • Members of ECHC attended the General Assembly in Richmond, Virginia where we received an award from the Washington DC Office of PC(USA) for our environmental work. • Members of ECHC joined PDR in a mission trip to rebuild private homes in Gulf Port, MS following the Hurricane Katrina disaster. Two such mission trips were completed; one of our members just returned from a mission trip to Aurora, NC. • Members of ECHC assisted a college student in her attendance to the Lake George Conference by securing a scholarship; as a result she was able to enter graduate school to pursue environmental studies at Duke University. She is one of three of our young people that have chosen environmental studies. • After the Lake George, NY Environmental Conference members of ECHC met “Biz” at the SNP to view land terrapins that had been electronically equipped for scientists to monitor their breeding and survival stats. • Members of ECHC traveled to Richmond to inform Massy Coal Company that their actions at the Marsh Fork School in West Virginia were unacceptable and required correction. (A coal tipple was adjacent to the school). Recently, the coal industry has built a new school to replace the contaminated structure. • In three consecutive planting seasons, members of ECHC traveled to the Volunteer Farm located on the Eastern slope of Shenandoah Mountain near St. Luke, Virginia to plant potatoes, onions and other seasonal vegetables to donate to the Blue Ridge Area Food Bank. 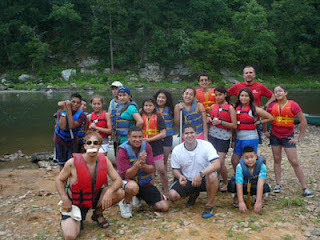 • Led summer night studies or bible school based on the valuable information and inspiration gained by members of ECHC at the National Presbyterians for Earth Care held at Montreat Environmental Conference near Black Mountain, North Carolina. • ECHC was an exhibitor at Green Innovations Tour 2012 held at Turner Pavilion, sponsored by Downtown Harrisonburg Renaissance. • A member of ECHC applied and received grant from Shenandoah Bicycle Coalition to place a bike rack on Trinity’s lawn. • A member of ECHC, who was a Stewardship Creation Enabler, received a $400 grant from PC(USA) for environmental work in Harrisonburg. He purchased 8 rain barrels and donated them to families with young children in our congregation. • An anonymous donation of $1,000 was given to ECHC to bring author and sustainable farmer, Richard Cartwright Austin, for a Friday night and Saturday workshop held at Trinity. • Members went to Lambert Cabin in the Shenandoah National Forest. The cabin is owned by the Potomac Appalachian Trail Club. Additional members joined for worship and a shared meal later during the retreat. • Members went to Highland Conference Center, a Mennonite center on the edge of North Mountain in the George Washington National Forest. • Members went to Kayford Mountain, WV, to view first hand mountain top removal spending an afternoon with Larry Gibson, a mountaineer whose family lived in the area. Residents have literally been driven from their Cabin Creek homes by continuous blasting. The tour was followed by an overnight retreat at Hawks Nest State Park. • ECHC member organized a group of volunteers to tutor students at Keister Elementary School. Four of the 19 volunteers were members of ECHC . Worked with youth of Trinity for six weeks during Sunday School weatherizing the older part of our building. ECHC routinely assists Health Helpers House Church by furnishing food for the doctors and nurses who volunteer at the Harrisonburg Rockingham Free Clinic. Members of ECHC prepare and deliver food to the Free Clinic ECHC hosted with Cooks Creek Presbyterian Church one night of feeding the clients housed in the HARTS shelter. We prepared for approximately 50 clients. Harrisonburg and Rockingham Thermal Shelter operates in the larger churches in the downtown area. We served, ate with the clients, cleaned up the kitchen. Several members counseled those clients who wanted to verbalize how they came to be at the shelter and some of ECHC members stayed overnight. ECHC continue their forward thinking and leadership in caring for God’s creation. Their very large group of 16, concentrate on environmental, peace, civic, social and eco-justice issues. They have co-sponsored Town Hall Meetings on air pollution. Outdated power plants in Virginia and other states appear to be harming the streams and forests in the Shenandoah Valley. Several members went to SNP to get signatures and present them to Congress in an effort to get scrubbers placed on these plants. ECHC is very interested in hydro-fracking that is beginning to be discussed in the northern area of Rockingham County. As part of their church audit, ECHC worked with the youth to weatherize the older section’s doors and windows. The General Presbyter of Shenandoah Presbytery appointed one of the ECHC members to serve on the Board of VICPP (Virginia Interfaith Center for Public Policy). Her work was focused on the environment, at risk children and youth and payday lending. Several members promote peace efforts through their affiliation with Veteran’s For Peace. In an attempt to keep the community and their congregation fully informed members of ECHC make presentations at churches, universities, Sunday school classes, summer night studies, wineries and other facilities. They refer to scripture and hymns that relate to God’s creation. They prepare and participate at the Church House on Earth Day Sunday and write articles of interest for Trinity’s monthly newsletter.